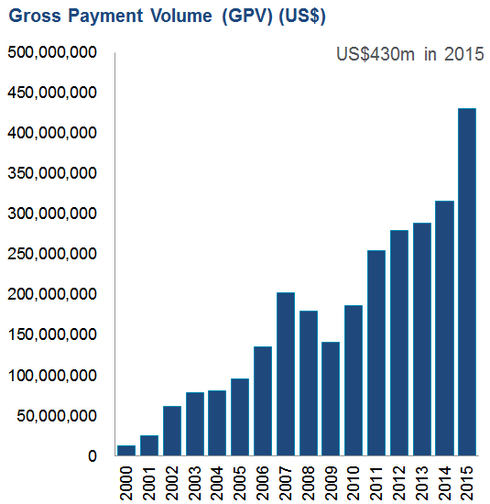 Escrow.com provides data on transactions, including the impact of China. Freelancer.com CEO Matt Barrie (podcast) presented data from Escrow.com at NamesCon yesterday. There are some fascinating stats, especially when it comes to the impact of China. Just to clarify Andrew, are these $430 million of payments in 2015 domain name related or all of escrow.com revenues? Interesting to see that purchases by Chinese buyers fell just short of 50% of overall Escrow.com spending volume during 2015. 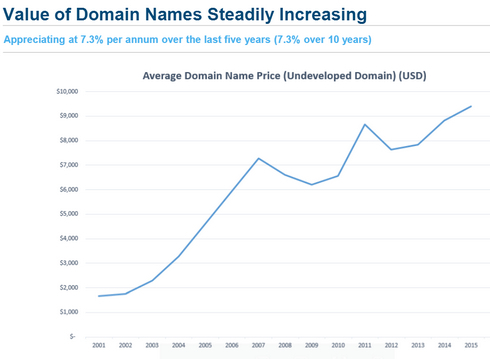 Earlier this week, DNW mentioned the official percentage reported by DomainNameSales, which was 57%. And for quite awhile I’ve been making related estimates on NameJet transactions above $2k. It’s been a boon. On the flip side, that market share might also represent risk / exposure if the Chinese market contracts or slows. True. The wise will seek to use their profits to diversify cash flows so that they have multiple pillars holding them up. Unfortunately as an emerging industry, there are not that many safe places to hide in case of significant market shocks. On the flip side, we may also avoid getting torched because we are rather small by comparison. Similar to countries without significantly developed financial sectors in 2008/2009 that avoided real estate and banking contagion. @Andrew: thank you. Was there anywhere an indication of how much of that revenue is domain name escrow? Very curious. Still amazed they sold only for $7.5m last year. Either the multiple was unnaturally low, or there was something more under the counter. @Joseph: interesting, have you confirmed them by the whois change? Don’t have that feeling that 50% of those are Chinese. 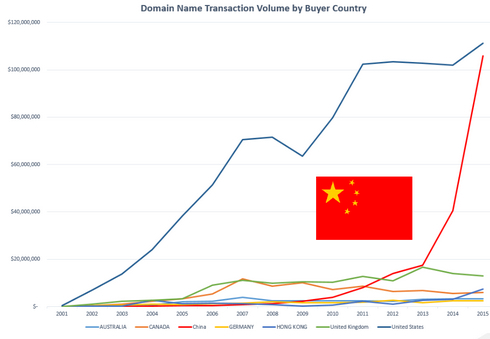 When I estimate Chinese-style trading at NameJet, I reference domain type itself rather than the nationality of the buyer. That’s because I’m usually reporting during a transitional period right after the auctions have concluded; and at that point many domains have yet to change hands. Plus, I’d consider intermediary reseller in the West as part of the Chinese market if they aim to sell their inventory to China. So, for example, I will count a numerical domain as Chinese even if the buyer is Jim from Kansas City. That’s partly why my numbers are higher than those reported by Escrow.com and DomainNameSales. I could follow up and collect whois information after another week’s delay. By then, domains should have transferred. And at that stage, I’d have a more accurate count based on buyer nationality. But it’s time-consuming work. Nobody pays for research in this industry; so I probably won’t bother looking, to be honest. We could probably find a way to automate a lot of that. This research is important. Something to ponder on. Filtering it out is skewing the research indeed. Still working on an automated solution. Also if the buyer is in the US, it is very difficult to guess what sort of the exit he or she had in mind, either to the Western or Chinese clients. Probably both, and any sale, domestic or international is good. The sellers never mind. Keep in mind they make only a small percentage of each transaction. Then they have pay overhead, licensing, bank fees, etc. They sold for 6.25x EBITDA. I do think there’s tremendous upside on the business. Beyond this, the long-term data for the stock market points to that 7% number as well. For the period 1950 to 2009, if you adjust the S&P 500 for inflation and account for dividends, the average annual return comes out to exactly 7.0%. Check the data for yourself. Based on these two things – the raw historical data and the analysis of Warren Buffett – I’m still remain unwilling to use 7% as an estimate of long-term stock market returns. 7% says risk adverse all over it. 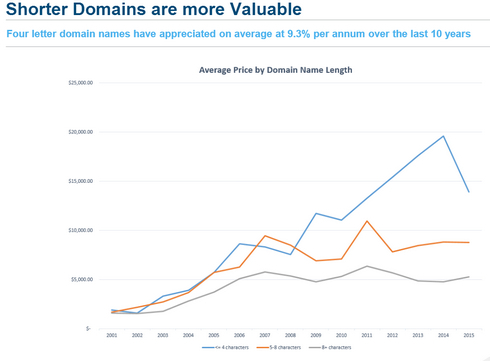 If you take a look at my domain portfolio, you would understand that I’m certainly far from being risk adverse – and the fact that I expect 20% from the stock market and 50% ROI from domain sales should come at no surprise. Don’t get me wrong, I lose a ton of money as well. Still, there’s one big problem. Past performance is no indication of future results, right?. That simple statement is true of any investment. It’s true of almost anything in life. This applied to domain names as well. We can’t anticipate what the future holds. Some people project the latter part of this decade holding an American economic renaissance thanks to our burgeoning energy independence and our long period of low interest loans funding rapid business growth. Others see economic doom in our future. Nothing is a sure bet. All we can do is put ourselves in the best position we can. For me, that means diversification, with part of that diversification coming in the form of domain names across numerous industries and representing countless professional services, trades & crafts.